Giant Mackerel Landed on Seaford Jetty! 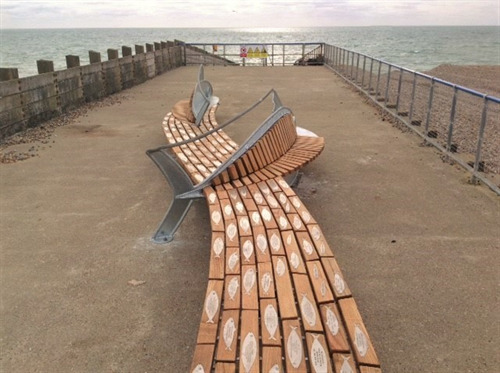 Come and visit the jetty at Splash Point this autumn and you will see Seaford’s remarkable Community Bench installation, The Shoal, which has now undergone its second installation phase, meandering further up the pier. A total of five giant Mackerel benches now glint in the sunshine, marking the completion of the second section of this amazing sculpture. These fantastical fish, swimming towards the sea, are linked together by a stream bench. Get close and you will see hundreds of stainless steel fish swimming on the stream; get closer still and each fish has a touching message of joy, celebration or remembrance. This extraordinary artwork represents a coming together of the Seaford community. 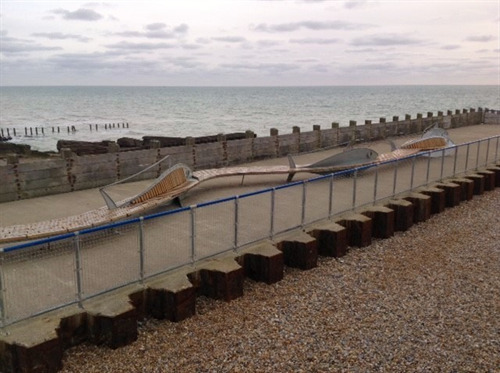 Each fish plaque has been sponsored by individuals and organisations with a love of Seaford. Sponsors who include visitors from around the world, extending all the way to Australia! The project is entirely self-funded by the purchase of different sizes of fish plaques (Sprat, Sardine and Herring), the romantic Love Fish, hung like bunting around the jetty, and the ultimate ackerel plaque which sits atop the Mackerel benches. There is still the opportunity to be part of The Shoal; any fish sponsored from now on will be placed on the third and final section of the bench to be added in April 2018. Do visit www.theshoalseaford.com for more information and an application form. Don’t delay as there is only room for just over 100 fish plaques in total. 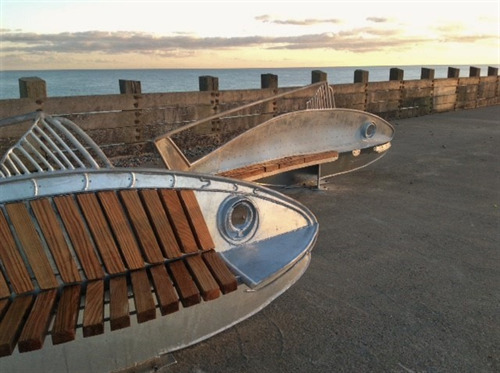 Seaford Town Council and the creative inspiration behind this wonderful project – Christian Funnell and Gabby Tofts – invite you to visit The Shoal and enjoy some of the most spectacular views in Sussex. With free seafront parking and cafés on the beach, why not make a day of it?